Team Teaching allows two or more instructors to combine their courses into one Moodle course. Content can be created and managed by all instructors. Each instructor is still responsible for the grading of their own students, which are enrolled into the course as separate section groups. PLEASE NOTE: This process should be completed before content is added to either of the courses. Note: One instructor in the team needs to initiate the course creation process. 2. 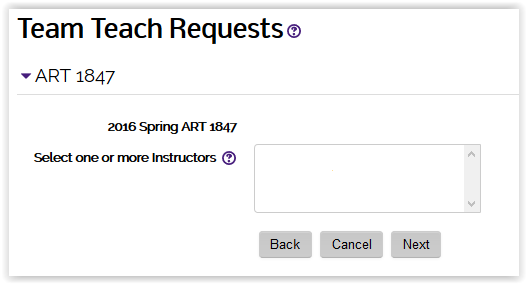 Click the Team Teach Requests link in the Course Preferences block on the Home level of Moodle. 3. Click the box next to the course that you want to include in the team teach combined Moodle course and click Next. 4. Set the pull-down menu to how many courses will be combined with the initiating instructor's course and click Next. Example: If a total of 2 courses will be combined, select the number 1. 5. Type the Department ID and the Course Number for the course or courses that will be combined, then click Next. 6. If more than one section of the courses are offered, choose the particular section and instructor that you will be inviting to team teach, then click Next. 7. View the confirmation page to make sure your selections are correct. If correct, click the Next button. If you need to make changes, click the Back button to return to the previous pages. 8. An email will be sent to the instructors who are invited to join the team teach course. Click the Continue button. 9. The Team Teach page will show that team teach has been chosen for that course. 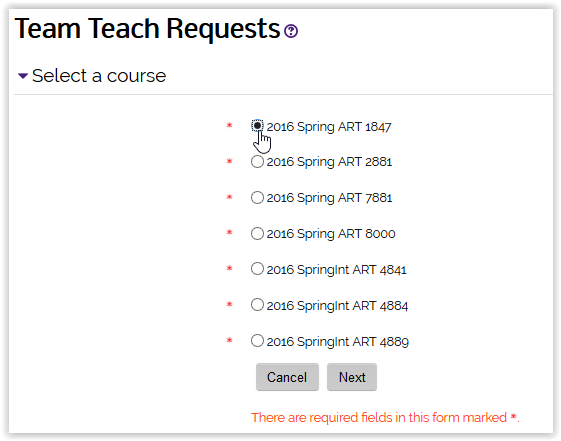 Click the Home link in the upper right of your Moodle page to leave the Team Teach Requests page. The Team Teach course will be created after the invited instructor or instructors click the Accept link in the email that they receive. Before the course is created and enrolled with students, all participating team instructors must finalize the process by moving their sections into the new Team Teach course shell. Once the invited instructors have accepted the invitation, the initiating instructor will be notified by an email. You will then need to select the sections of your course to include in the Team Teach course. 2. 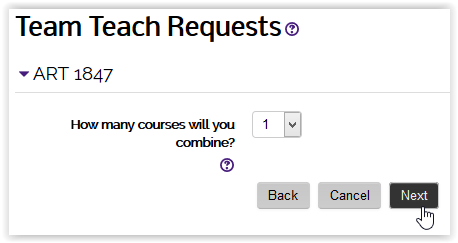 Click on the Team Teach Requests link, located in the Course Preferences block on the Home level of Moodle. 3. Click the box to the right of the course name and click Next. Note: To the right of a course that initiated the request, a (Team Teach option taken) notice will appear. 4. Click the Manage Sections option and click Next. 5. Confirm the section to include in the Team Teach shell. Click Next. 6. Click the section name in the box to the left to select it. 7. Click the Right Arrow button to move it into the new Team Teach shell on the right, and click Next. 8. Confirm your section in the new Team Teach course. Click Next to complete your part of the process. NOTE: After the Initiating Instructor has moved sections into the new Team Teach course shell, each and every other participating team member must complete steps 1 through 7 to move their sections.